There’s still a possibility the 2014/15 El Niño could die even though it had so much promise just a few months ago. In this post, we’ll compare a few indicators now to where they were 2 months ago at the start of the El Niño enthusiasm. Some of them show an off-season event quickly drawing to a close. We’ll examine other metrics that show the El Niño may not be done yet. And we’ll look at data for a couple of occasions when El Niños looked promising in the first part of the year and then failed to form into a full-fledged El Niño during the remainder. One year, we were coming out of back-to-back La Niñas and the ENSO models predicted an El Niño, and for the other year, El Niño conditions evolved early, like this year, but then retreated over the rest of the year. First, let’s clear up one thing. I’m not saying the 2014/15 El Niño will die. However, data-based maps and cross sections of the warm water in the eastern tropical Pacific indicate the warm water from the Kelvin wave is being “consumed” quite rapidly. If they’re correct, there won’t be much warm water left if and when we see the feedbacks required to further evolve and sustain the El Nino. Then again, the warm water volume data above the thermocline and depth-averaged temperature data to 300 meters, both for the eastern equatorial Pacific, indicate the warm water is not disappearing as fast as suggested by the maps and cross sections. For all of the seasons being predicted in this particular forecast, El Niño is the most likely category, with the red bars towering over the other bars. During the latter part of 2014 its probability is near or above 80%. This is a fairly confident forecast for El Niño, but it does still leave about a 20% (1 in 5) chance of it not happening. While it’s not a high probability according to the models, there is a chance that this El Niño could die. But let’s look at a few indicators other than models. The chatter about a possible El Niño for the 2014/15 season skyrocketed in April this year. It was based on the strong Kelvin wave that had traveled east across the equatorial Pacific. Due to the strength of that Kelvin wave, some ENSO researchers and laypeople started proclaiming a super El Niño was on the way, but the feedbacks needed to turn this El Niño into a super El Niño, like the one in 1997/98, failed to develop. That is, after the westerly wind bursts that initiated the Kelvin wave this year, the trade winds have not weakened to further help the development on the El Niño. The researchers have since cut back on their estimates of the size of the El Niño, and the models are still predicting a remote chance an El Niño will not continue to develop this year. All depends on the trade winds, which may not cooperate…and so far they have not. That initiating Kelvin wave and the reasons for its existence were discussed in detail in the first post in this series. Also see the latest (2 weeks old) gif animation of sea surface height anomalies and subsurface temperature anomalies for the top 300 meters of the oceans I prepared for the June update, and refer to the latest animation of the temperature anomaly cross sections for the equatorial Pacific from that post. A couple of weeks have passed since that update and appearances have changed drastically in that time. So let’s take a look at a few gif animations that compare the most recent maps and equatorial cross sections to those from 2 months earlier. The maps and cross sections are available from the NOAA GODAS website. While the sea surfaces of the equatorial Pacific have warmed in those two months, the other metrics show weakening remnants of that Kelvin wave. Some of that decline happened because that warmer-than-normal water is rising to the surface, where heat is being released to the atmosphere through evaporation. But, there’s something else to consider, and we illustrated and discussed it in the second post of this series. 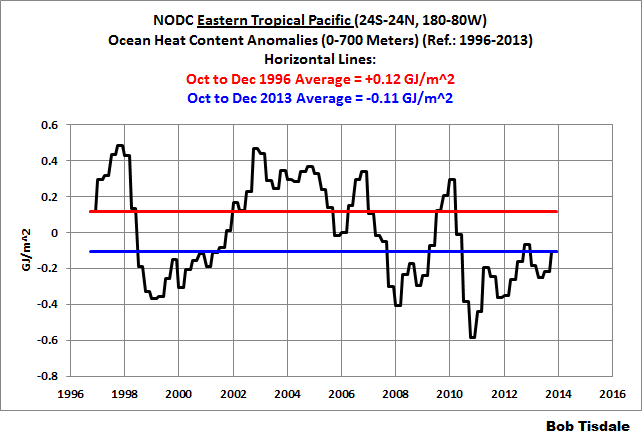 The ocean heat content of the eastern tropical Pacific (24S-24N, 180-80W) was much lower before this El Niño began than it was before the start of the 1997/98 El Niño. See the graph here. In other words, while the Kelvin wave this year was strong, it traveled eastward into a cooler environment. That may also be impacting the evolution of this El Niño. The title of the post is based on the recent maps of pentadal (June 17th) GODAS depth-averaged temperature anomalies and sea surface height anomalies and on their equatorial cross sections of subsurface temperature anomalies, not on sea surface temperature anomalies. Later we’ll take a look at the data from the NOAA Tropical Atmosphere-Ocean (TAO) Project website. Preliminary discussion: If we looked at the evolutions for all of the El Niño events since 1982, the evolution so far this year would not look out of place. See the 4th post in this series. In other words, don’t sell this one short…yet. And as we’ll see with the sea surface temperature anomalies for the NINO1+2 region, strong east Pacific El Niño events can develop quite late in the year. But Figures 1 and 2 (that follow), along with the graphs in the 4th post in this series, can give you an idea of the problems researchers face when trying to predict an El Niño early in the season. No two El Niño events are the same…and some of them can fail to develop. In a number of the posts in this series about the 2014/15 El Niño, we’ve illustrated the evolution of the sea surface temperature anomalies for a number of NINO regions this year and compared them to the evolutions of the strong El Niños of 1982/83 and 1997/98. Of course, for the (most commonly used) NINO3.4 region, the sea surface temperatures for this El Niño are far below those for those super El Niños. But in the eastern equatorial Pacific, in the NINO1+2 region (south and west (oops) east of the Galapagos), the sea surface temperature anomalies this year are between those for the two often-referenced strong events. But where does this El Niño fall when compared to a year when El Niño conditions developed early but then failed to last long enough to meet the requirements for an “official” El Niño…or for a year where the models predicted an El Niño but an El Niño failed to form? For an El Niño to be an official event in NOAA’s eyes, a 3-month running average of the sea surface temperature anomalies of the NINO3.4 region must remain at or above +0.5 deg C for 5 consecutive months. (See NOAA’s ONI webpage.) In 1993, weekly NINO3.4 sea surface temperature anomalies rose above 1.0 deg C early in the year, considerably higher than where we are this year, but then weakened. And in 2012, the ENSO models were predicting an El Niño for the 2012/13 season, but one failed to develop. See pages 25 to 28 of the WaybackMachine-archived NOAA ENSO Update for June 11, 2012. So let’s add 1993 and 2012 to the evolution comparisons. 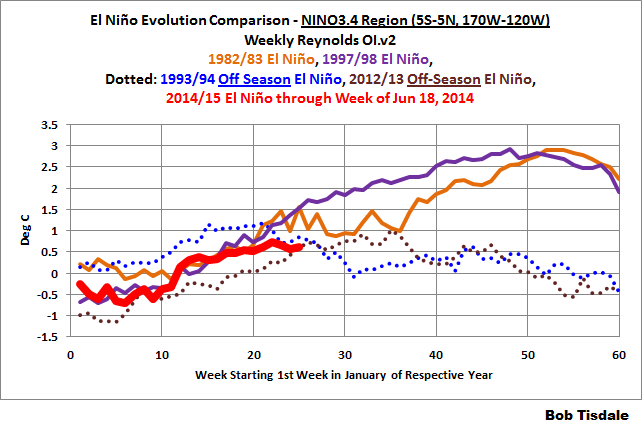 See Figure 1 for the NINO3.4 region (5S-5N, 170W-120W) data, and Figure 2 for the NINO1+2 region (10S-0, 90W-80W). Again, if we were to add all of the El Niño events since 1982 to those graphs, the current values would not be out of line. But Figures 1 and 2 illustrate that the equatorial Pacific can give evidence of an El Niño early in the year, and then the El Niño can fail to develop to meet NOAA’s requirements for an official event. And in 2012, the ENSO models were predicting an El Niño and the models missed the mark. The sea surface temperatures warmed in mid-year, but then quickly returned to ENSO neutral conditions. Curiously, the maps and cross sections appear to show a quick drop in the warm water volume, sea surface height, and depth-averaged temperatures in the eastern equatorial Pacific but the data, which for June are month-to-date values, do not seem to reflect that. Why? The “data” presented by the TAO website is actually a reanalysis based on the data from their floats, and it’s calculated from the Australian Bureau of Meteorology Research Center (BMRC) Ocean Analyses. See the TAO project “read me” file here. And while I know the values of the data for the current month do change over the course of the month, I do not know how frequently they’re updated at the TAO project website. (I downloaded it this morning.) 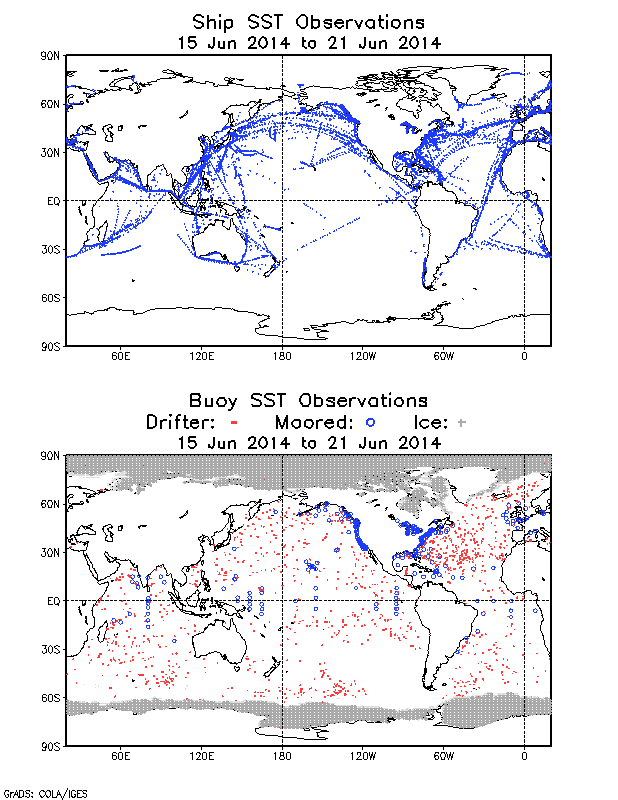 On the other hand, the maps and cross sections at the GODAS website are based on NOAAs GFDL MOM.v3 reanalysis. See the GODAS introduction here (pdf). Both reanalysis should be relying on the same TAO project buoy data, and one would think they both would be using data from ARGO. GODAS appears to use satellite altimetry data for their sea surface height maps, but is satellite altimetry also used in the BMRC reanalysis? Dunno. One of the problems may be the reduced operation of the TAO project floats, caused by NOAA budget cuts. (See the concluding remarks at the end of first post in this series.) And another problem may be, there may not be enough sensors that far to the east along the equatorial Pacific. See the bottom cell of Figure 5. The bottom cell of Figure 5 presents the buoy-based observations used in the Reynolds OI.v2 sea surface temperature data for the week of June 15-21, 2014. In addition to surface temperatures, the TAO project buoys in the tropical Pacific (blue circles) also measure subsurface temperatures, as do the ARGO floats (red dots). We can see that the TAO project buoys in the eastern tropical Pacific are operational (or were last week), but they only reach as far east as 85W. Which reanalysis is correct? The new NOAA Real Time Multiple Ocean Reanalysis Intercomparison website presents their comparisons of 6 reanalyses on a monthly basis, so they would not have captured the sharp decline in recent weeks shown in the GODAS maps and cross-sections. For a quick introduction to the NOAA Real Time Multiple Ocean Reanalysis Intercomparison website, see the post here. It really is unfortunate that NOAA cut the budget for the maintenance of the TAO project floats. Without more westerly wind bursts and a weakening of the trade winds in the western equatorial Pacific, the warm water in the eastern equatorial Pacific will continue to decline, and we could very possibly have another ENSO-neutral year. So far, those feedbacks have not kicked in. See the most recent post in this series (Part 10) for a further discussion. 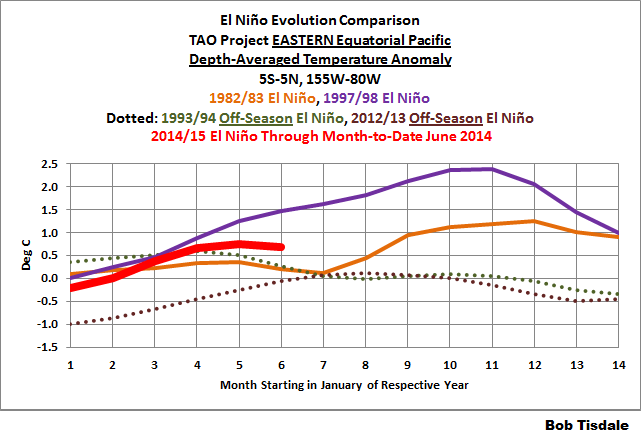 33 Responses to The 2014/15 El Niño – Part 11 – Is the El Niño Dying? One Kelvin wave does not necessarily make an El Niño. I once again turn to the nonLa Nina, nonEl Nino events. I disregard anthropogenic issues, believing that the amount of re-radiated LW that can enter such a huge span of water would not be measurable and barely calculable. Given the amount of heat that has been released and the less than stellar recharge events (IE strong, clear sky La Nina’s), I think the previous substantial amount of absorbed solar energy that overcharged the oceans prior to the strong 1998 discharge, has reached a “knee” and is beginning to demonstrate to us that there ain’t much overcharged heat left, as in it has finally petered out. And in addition to that, we have not had recharging events strong enough to write home about since the 1998 heat discharging El Nino (meaning we have had stronger heat discharging than heat recharging events). This is why I think that the place to look for predicting future directions of ENSO events is in the length and direction metrics of El Nado, Neutral, and La Nada episodes. I know this is unscrutinized data territory ripe with plausible heat charging and heat discharging algorithms and calculable mechanisms using heat budgets that could do a much better job of predicting the knee of oscillating events further into the future than we currently have. So based on my back of the envelope estimation, I think the pause in global temperatures can be adequately explained using the probably calculable mechanism of overall all heat loss in the equatorial Pacific Ocean. I base that speculation on the stair step function Bob has developed that combines heat discharging El Nino events with land temperature trends. It not only adequately demonstrates the rise and pause of global temperatures from that heat, it also clearly shows us something much more important during the La Nado, Neutral, El Nado events. We have been losing ocean heat to discharge events, which explains global temperature rise because of that heat discharge from ocean storage roaming the atmosphere and being consumed and/or lost by Earth’s land and atmospheric environment. The pause tells us that we are now out of overabundant heat and have not had adequate recharging events to match heat discharge, let alone overcharge the oceans. I predict we are at the heat storage knee and will be heading down in stair step fashion unless we get another strong and long La Nina event. Soon. In fact, let us hope NOT for another El Nino of any strength. We can’t spare the heat. We have lost enough during the rise and this long non-event pause as it is. 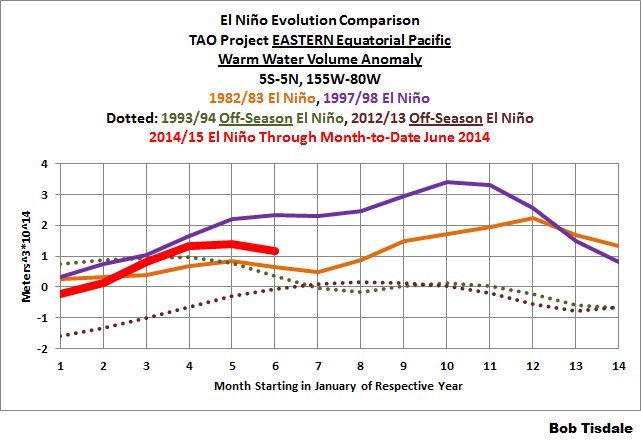 It is fantastic to follow the development of the 2014 El Niño in your excellent posts. Time will tell, we keep on watching nature do its thing. Bob, I downloaded and excel-ed the data file for both the extended (from 1870s to 2005) and the current MEI (from 1950 to present). Now I need to pull-out the La Nada/Neutral/El Nado info. What positive and negative values do you suggest I use for the outer brackets (as you know the data is binned into two month running averages)? I am thinking either slightly above plus/minus .5 (the standard) or maybe higher to capture weak events. If higher what would you choose? Pamela Gray, if you stick to the convention, then you don’t have to explain why you deviated. Thanks Bob, watching this event unfold has been made a lot more interesting by your updates. Very interesting to watch, many thanks for your help. I have screen dumps, if they are of interest please do not hesitate to make contact. Thanks Bob. Convention first it is. With the same webpage Green Sand used, I found in 850hPa wind map, the Asian Pacific Westerly Monsoon fights with Central Pacific Easterly Wind, and Asian Westerly Monsoon is advancing from last Monday till now. Can it be the signal of another Kelvin Wave? G. Y. Evan, that possibility definitely exists. There was a recent post at WeatherUnderground, where it was noted that there COULD BE another westerly wind burst in response to the Madden-Julian Oscillation (MJO). We’ll have to watch and see what happens. 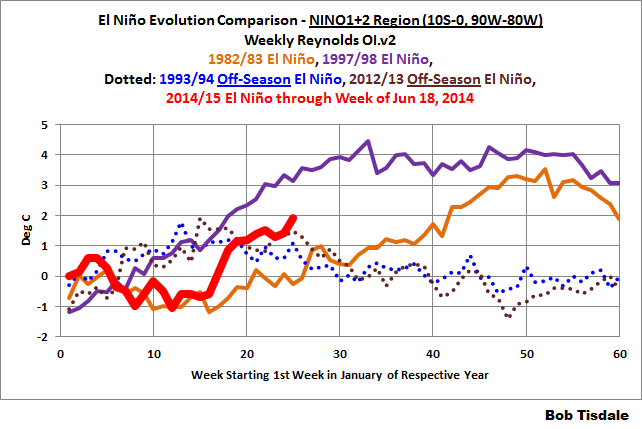 Anyhow over the last few days the picture EWM is showing of ENSO 1 & 2 is a changing one. Further to my post above there are now areas of negative SST anomalies off the coast of Ecuador plus a general overall cooling in the area. The area of warm water further south, off the coast of Peru, has reduced in area. Quite a change in only a few days. This “event” is proving to be very interesting. Maybe if there is to be a significant event later in the year might it be a new entity? Not sure the present one intends sticking around for the fall. As always only time will tell.